I once had the opportunity to give a lecture to the staff of a new restaurant in Nagoya that served predominantly Japanese sake. It’s been about two years since I’ve been back, but according to rumors it is doing quite well. Sometimes I find myself grinning at the comments left on a particular gourmet site. In addition to their standard stock, they seem to be introducing new and seasonal stock all the time, so I get the feeling they now know more about Japanese sake than I do. Yesterday I had pulled out my old computer looking for a document that I needed, when I came across one of the handouts I had made for that lecture. It was not very polished, but getting a fresh look at it, I thought I had done a pretty good job considering I had written it up in only one night. There were some minor changes I had made to adapt it for another lecture the following year, but as I dusted off this handout that lay dormant at the bottom of my hard drive, I felt the urge to air it out again on my blog. For those of you saying, “I do like Japanese sake… But when I’m looking at the sake list at a Japanese restaurant or looking at the labels they have lined up in their refrigerator, it’s all just gibberish,” please read on. Hopefully it will help you out when choosing sake for your next get-together. Junmai Daiginjo, Junmai Ginjo, Junmaishu, Daiginjo, Ginjo, Honjozo, Futsushu, Say What? ★It is easier to visually explain it, rather than using words. I want to avoid chopping logic. ★Shinshu is a new sake that is freshly brewed and shipped during the prime sake brewing season of winter. It has a fresh, tingling flavor. It has also been described as having a fruity “young” or “green” taste to it. The peak season runs from about November to February. It is a season to look forward to. ★Hiyaoroshi is a sake that is brewed in winter, aged in a brewery cooling tank, and shipped in the autumn when it has matured. Compared to Shinshu, it no longer has the rough edges and is smooth. ★It is a Japanese sake measurement that is taken by plunging an instrument called a hydrometer into sake and measuring the mass, or rather the weight. It is probably best just to remember that, generally, the higher the density, the more “dry” the sake. The reason is that, high sugar content = sake is heavy → hydrometer floats = the scale moves in the minus direction → “sweet sake”. 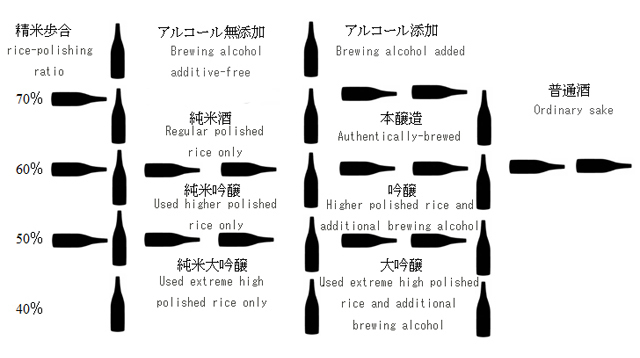 However, since specific gravity has a considerable effect on amino acids, alcohol content and whether the sake is undiluted or not, just consider it as more of a guide. ★Sake is basically raw. It deteriorates and rots. That is why there is a two-stage processing: (1) the squeezing out of the tank stage and (2) the bottling and shipment stage. Hiire is the pasteurization process in which sake is heated to a temperature of about 65°C to prevent deterioration. Generally, if you cannot find anything on the label that says namazake, namachozoshu or namatsume, it is safe to assume it is hiire. ★Namazake is sake that is distributed without having been heat-pasteurized as described above (please see “What is Hiire?”). It must also be stored in a cool place to maintain freshness, especially once it has been opened. Never leave an opened bottle in room temperature. The taste will deteriorate and bacteria will grow. Namazake tastes fresh, young and fruity. It has recently become a popular way of enjoying sake, much like muroka (non-filtered sake). Even though it is all sake, comparing hiire to non-hiire is similar to comparing sashimi and broiled fish… Well, maybe not that different, but there is a significant different nonetheless. Also, many namazake have a distinct sweetness to them, so they do not always seem to go well with various dishes, and those who like “sake that tastes like sake” may not like it much either. However, it has very often become a doorway into the world of sake for foreigners, women, and people who have never liked sake. What are Namachozoshu and Namatsume? ★Sake that has been pressed and has undergone the hiire process before being allowed to rest in a tank is called namachozoshu. Sake that was stored unpasteurized, and then is pasteurized prior to bottling and distribution is called namatsume. It is confusing. I, too, sometimes forget when I am enjoying a lot of sake. ★This is a Japanese sake that has been ages over months and years, much like wine or whiskey. The concept of aging sake is, actually, fairly new and has begun to draw attention. Today, various warehouses have begun researching and developed into a genre that will continue to draw attention. It has a different kind of sweetness from that of namazake and other sake with high sugar content. It is a heavy body and mellow sake with a complex taste. Older ones taste a bit like Shaoxing wine. It goes relatively well with dishes with strong flavors. ★Roughly speaking, it is “unfiltered alcohol”. More roughly speaking, it is somewhere “between nigori and standard sake”. If you find “usunigori” written on the label, it is safe to assume it is muroka or something close. Tanrei-karakuchi is smooth and clear, like water. It has become mainstream “good sake” since the 1990s when sake became popular. Muroka is the opposite …is a slight misconception. When you drink it, you get the impression that it is more a “different vector”. There is bit of bitterness to it, but it also retains the essential umami and characteristic of rice that gives it an interesting personality. It can be said to be a new genre of sake that has been taking its place in liquor stores these past 5 to 10 years. 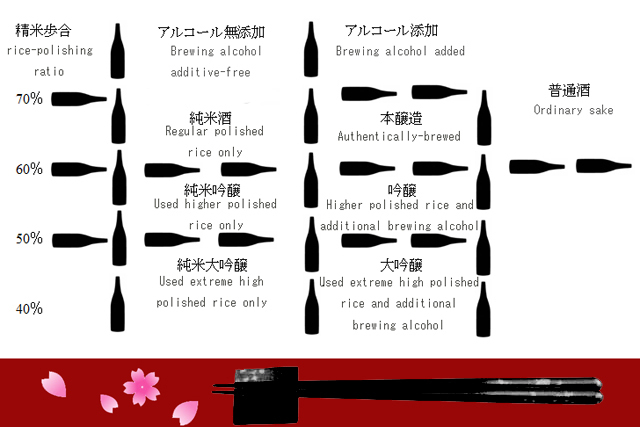 ★With standard sake, water is added to adjust alcohol concentrations and taste. Genshu is straight sake. It is characterized by its depth of flavor and high concentration of alcohol. Standard sake has an alcohol content of about 15 percent, but genshu can hover around 20 percent. It has about the same concentration of alcohol as low-percentage shochu. What are Kimoto and Yamahai? ★During the manufacturing process of sake, lactic acid is often added to inhibit the growth of bacteria. With kimoto and yamahai, lactic acid is not intentionally added. Instead, lactic acid bacterium somewhere in the sake brewery somehow finds its way into the tank through some kind of “force of nature”, and utilized to brew sake the old-fashioned way. Brewing kimoto involves an arduous process called “yamaoroshi”, which is the constant stirring of moromi for an entire night. Yamaoroshi is an abbreviation of “yamaoroshi haishi”, literally “yamaoroshi disuse”. Sake brewing used to be an unstable process, but thanks to improved techniques, the ability to brew a perfectly good quality of yamaoroshi is now firmly established. Nevertheless, it is a laborious method that requires a greater deal more attention than relying on added lactic acid. Characteristics… A full-bodied flavor. Even when matured, it does not affect the flavor. It has a rich, full-flavored umami, and tastes best when at room-temperature or hot. What are Arabashiri, Nakadori (Nakakumi）& Seme? ★During the process of using bags to squeeze out sake from moromi (the state in which sake lees and sake are mixed together), the first sake that is extracted without applying any pressure is called “arabashiri”. The sake that is pressed slightly by hand is called “nakadori (or nakakumi)”, and the sake taken from the last of the squeezing is called “seme”. Also, if there is nothing in particular noted on the label, you can assume it is a mixture of the three types. ★This is sake that is taken straight from the tank (without being squeezed). It often has a vivacious taste to it because it has had little exposure to the air, and retains carbon dioxide and freshness. What are Fukurotsuri, Shizukuzake, Tobinkakoi? ★When we get to these kinds of sake, we begin entering the realm of sake maniacs. If your curiosity has been ignited, I suggest you look them up online or in a book.